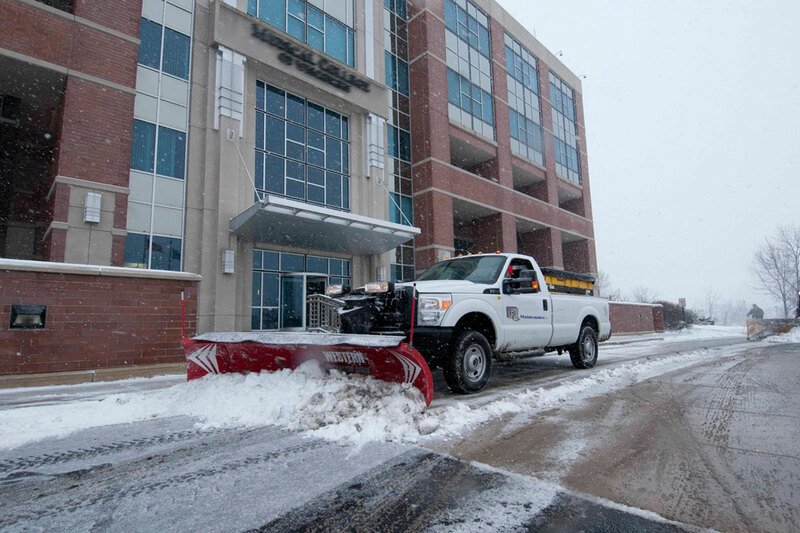 We offer a full service commercial snow removal service complete with snow shoveling of walkways, patios, and decks. Our equipment and crew will perform services safely and efficiently, taking care not to damage vehicles, curbing, speed bumps, signs, bollards or car stops in your parking lot. We offer Snowplowing services to Commercial customers. We have top of the line equipment to meet each individual need of the customer. We are equipped to haul away snow from sites that have limited space using tractor’s and bucket loaders. PC Maintenance has staff on hand to shovel walk-ways and sidewalks. We use Magnesium Chloride to reduce slippery surfaces to ensure safe walking and driving conditions. We will install markers along the curb and shrubbery to avoid any damage during Snowplowing. PC Maintenance will come to your site at winter’s end and remove all curb markings. We can also clean up the dirt build-up and trash that has been sitting on your lot during the winter.